For first applications of AlgoRhythm Technologies, we developed products lines that could be mass customized for walls and ceilings, both interchangeable. The products permitted infinite variability in proportions and were panelized to cover large areas. 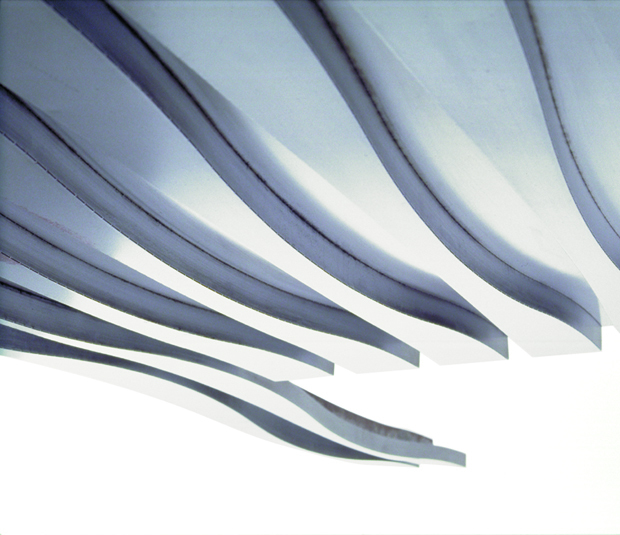 Attachment details between panels, panels and walls, and to ceilings were developed by Milgo. Numerous prototypes (1997-99), most in stainless, painted or lacquered steel, were folded from single sheets using as seen in these photos. Prototypes were developed as finished products at Milgo where new fabrication technologies had to be invented to manufacture these economically and with ease. See Haresh Lalvani’s article Meta Architecture in AD, Architectural Design, HyperSurface Architecture II, vol. 69, 9-19, 1999, Profile 141, guest ed. Stephen Perella, 32-37. Fig 3 from that article is reproduced here. Stephen Perella’s school in Staten Island (with architect David Businelli) was the first project outside Milgo where we customized our Ripples system to St Claire’s Early Childhood Development Center (2002). Four AlgoRhythm Columns, in folded titanium, were acquired by the Museum of Modern Art (MoMA), New York, for their permanent design collection.